Delphi! One of the most important archaeological sites in the world, in one of the most beautiful Natural Areas of Greece! 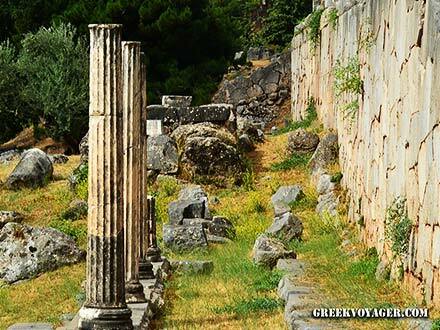 The Sanctuary of Apollo, with the most important oracle in ancient Greece! 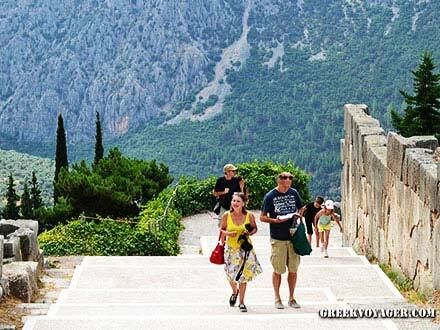 In Central Greece, in the region of Phocis, on the southern slopes of Mount Parnassus, the sacred mountain of antiquity! Overlooking the green valley of the Plistos River, beside the vast olive grove of Amfissa, facing the Corinthian Gulf! 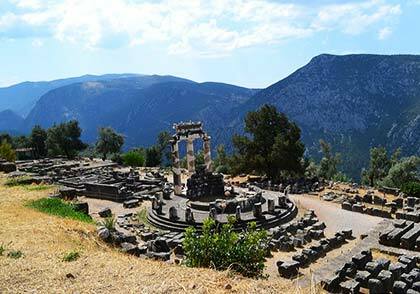 The entire area of Delphi is included in the list of UNESCO world cultural heritage sites. MYTH: When Zeus wanted to find the center of the world, he sent two eagles, one from the east and one from the west. They met at Delphi. This place was the navel/center of the Earth! A magical place! The environment and the landscape, the rocks and the trees, the valley and the sea, the columns and the monuments! Myth and history! It’s an amazing composition, which enchants the visitor. You visit and when you leave, you want to come back. Again and again! Delphi is located in Central Greece in the region of Phocis with Boeotia bordering to the east. Phocis stretches from Fthiotis in the north and east, Boeotia in the east, the Gulf of Corinth to the south and Aetoloakarnania in the west. The archaeological site of Delphi extends across the southern slopes of Mount Parnassus, at an altitude of 550 to 600, between the towns of Delphi to the west and Arachova to the east. The Sanctuary of Apollo, with its temple, monuments, theater and stadium, as well as the Archaeological Museum is located on the upper side of the national road, as well as the Castalia Spring, to the east. Approximately at the height of the Castalia Spring, but on the lower side of the road, lies the Sanctuary of Athena Pronaea, with its famous Dome, and the Gymnasium of Delphi. Rising above the archaeological site are the Faedriades Stones (Petres), two steep rocks separated by a ravine where the Castalia Spring is located. In antiquity, the eastern rock was called Nafplia (Rodini today) and the western rock Yambia (today Flemboukos). The Plistos River, which starts between the mountains of Parnassus and Kirfi and crosses the valley below the archaeological site is propelled by the Castalia Spring emptying into the Corinthian Gulf near Kirra. MYTH:The river takes it name from Plistos, father of the nymphs of Mount Parnassus. In more recent times, it was referred to as Xeropotamos, perhaps, because during summer it is almost dry, but today it called by its ancient name. The region of Phocis is mountainous. Mountains of the area include Ghiona (2.510m), Vardoussia (2.406m), Iti (2.152m) and Parnassus (2.457m). 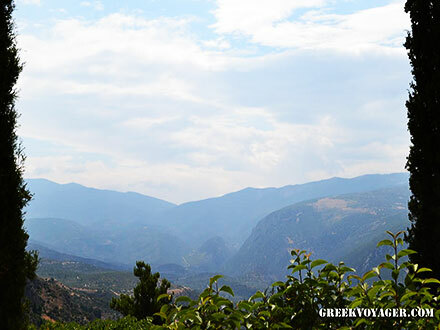 Parnassus is one of the most beautiful Greek mountains. MYTH: In antiquity, it was the sacred mountain of Apollo and Dionysus and home of the Muses. It begins north of Amfissa to the Ambliani pass where is separates from Ghiona, and continues southeast to the regions of Fthiotis and Boeotia ending after 30 km at Distomo pass. 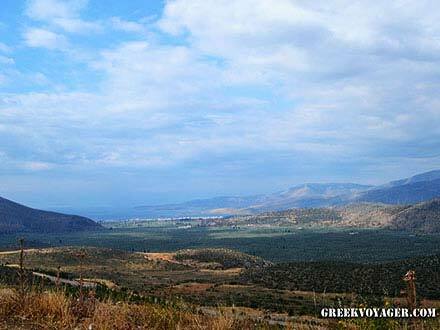 Its highest peaks are Liakoura at 2,457m and Gerontovrachos at 2,367 m.
You can reach Delphi by car from three directions; from the east, west and north. From the east, beginning from Athens, exit the National Road at Kastro and continue west passing the towns of Orchomenos, Livadia and Arachova; a total of just over 160 km; a two hours drive. From the west, beginning at Patras and Rion – Antirrion bridge, continue east along the north coast of the Corinthian Gulf passing the towns of Nafpaktos, Galaxidi and Itea, then, ascend the slope toward Chrisso and Delphi; a drive also two hours. From the north, beginning at Thessaloniki, drive south passing Lamia, Bralos, Gravia and Amphissa and from there to Chrisso and Delphi; about a four and a half hour trip. Delphi can be reached by bus from Athens (Bus Station, Liossion street – tel. 210 8317096), Thessaloniki (link bus in Amfissa) and Patras. There is also the option of the train from either Athens or Thessaloniki, disembarking at Livadia (tel. 22610 28661) and boarding a local bus to Delphi. It is also possible to take a ferry from the town of Aegion, near Patras, and go across to Aghios Nikolaos, in Phocis, and from there reach Delphi in an hour. The town of Delphi is located two kilometers west of the archaeological site. Here, there are many hotels and rooms to let; also restaurants and taverns, cafes, all services, art workshops and stores, as well as organized shopping. There are also hotels and taverns in the nearby traditional village of Chrisso. 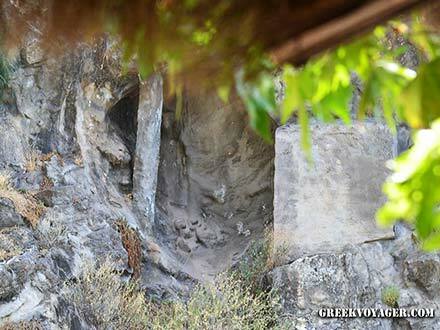 The capital of Phocis, Amphissa, is locatedt 20 km distance,. For those who prefer the sea, there are the beautiful seaside towns of Itea, Kirra or Galaxidi. 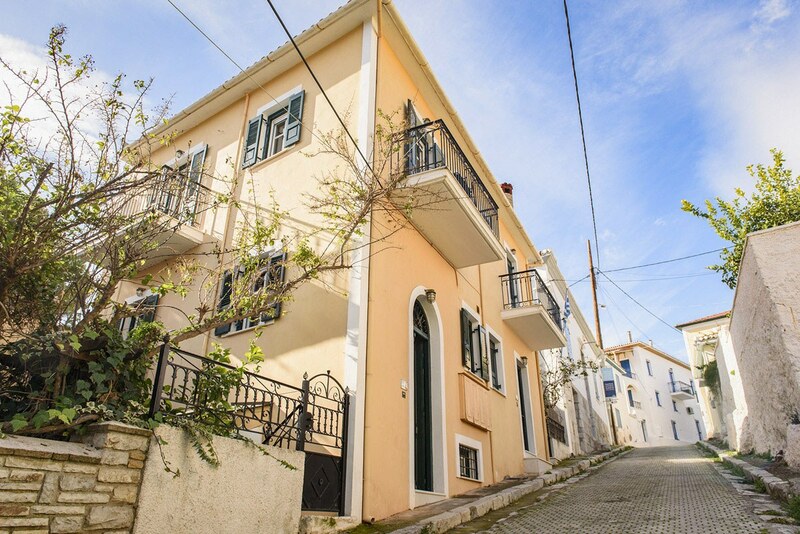 On the other side, 10 km from the archaeological site, there is popular Arachova, with hotels, grill-taverns, services, and shops. It is a prime winter destination for the Parnassus Ski Centre. 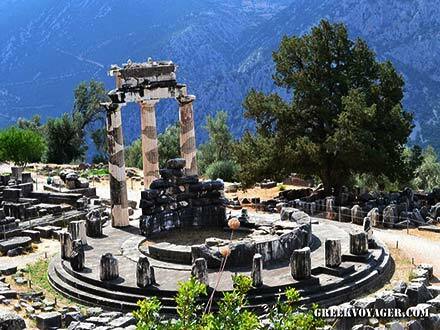 Visiting Delphi can also be combined with holidays at a further distance, either in one of the traditional villages of Parnassus, or one of the coastal villages on the northern coast of the Corinthian Gulf. The oldest finds at Delphi are from the Neolithic Period. They were discovered in the Korykion Antron, the famous cave above Delphi, at an altitude of 1,360 km. MYTH:The cave was dedicated to Pan, god of nature, and the Nymphs, goddesses of forests and waters. Mycenaean pottery was also uncovered and especially many votive statues from the Archaic, Classical and Roman times were found. Characteristic findings are the many animal knuckle-bones. Some experts say they were children’s toys while others suggest they were votive offerings concluding that the cave was an oracle. At the site of the sanctuary of Apollo remains of a Mycenaean settlement and a cemetery have been found, dating to 1550 BC, the beginning of the Mycenaean Period. They are considered part of a city founded by the Achaeans from Thessaly, which is referred to by the name Pytho in the ‘Catalogue of Ships’ of Homer’s Iliad, in other words, the list of ships that took part in the expedition against Troy. The Catalogue is a detailed description of the names of cities and leaders of their fleets. Pytho was one of the nine cities of Phocis that participated in the Trojan War. But it was deserted at the end of the Mycenaean Period, as many Mycenaean cities. Few houses exist for the period from 1200 to 800 BC, when the worship of Apollo prevailed and the development of the sanctuary and Delphic oracle began. 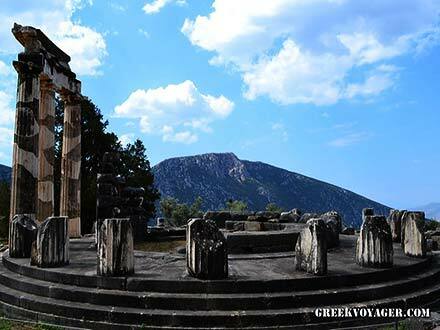 As everywhere, at Delphi mythology is the gateway to history. MYTH: The story goes that at the site in the far distant past there was a temple dedicated to the goddess Gaia. Statuettes of the goddess have been discovered in the temples of Apollo and Athena, which were founded much later. It appears that from the Mycenaean Period there was an oracle on the site, as well as a gap in the earth which leaked gas and attracted people who stood over it in a trance state. MYTH: The guardian of the oracle was the terrible serpent Python. Apollo killed Python with his arrow. He was still a child, or, according to another version, a baby. Then he was transformed into a dolphin and led priests from Crete to the port of Kirra, on the coast of the Corinthian Gulf and from there to Mount Parnassus, beneath the Faedriades Stones, where they founded the sanctuary. There are several versions of the myth. The fact is, the worship of the god of light and sun was at Delphi in the 8th century BC. At that time, the clay female figurines were replaced by bronze male figurines. The myth of Apollo’s rule survived in local celebrations. Mainly, at the Pythian Games, a Panhellenic event consisting of musical and athletic contests held every four years to commemorate the victory of the god against the Python. The oracle of Delphi quickly gained great fame and the sanctuary of Apollo Panhellenic prestige. 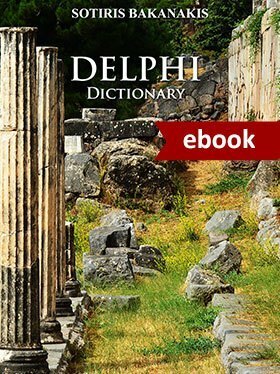 Delphi was the "navel of the Earth." Word of the famous oracle spread to the eastern Mediterranean and beyond. Prestige and fame brought thousands of offerings from cities, rulers and wealthy citizens. Many tributes came from Syria, Armenia and other distant regions. The sanctuary of Apollo reaped the largest collection of works of art and became the main source of knowledge on life and history of ancient Greece. In antiquity, the oracles were the portals for the gods to speak with humans giving them advice or oracles, while soothsayers explained the signs of the gods by observing the behavior of birds or sacrifices. 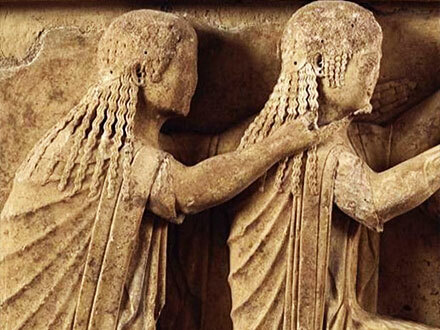 At the Oracle of Delphi, Apollo communicated with the priestess Pythia, who conveyed the oracles. Care of the oracle belonged to five men from the five major families of Delphi. 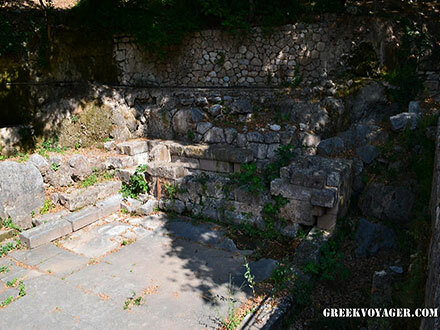 Those asking for an oracle – called “theopropoi” in ancient Greek - first were purified with the water of the Castalia Spring and then took the Sacred Way, which led to the great altar in front of the temple where they offered sacrifice. The inhabitants of Delphi had priority, followed by the citizens of towns who were honored with the foresight of forecasting the future; as well as prominent citizens. The others followed. The Pythia was also washed with the water of the Castalia Spring. After she had drunk the water and chewed laurel leaves, she entered the “adyton” (sanctum) of the temple. She sat on a tripod in a trance affected by the fumes emitted from a crack in the ground. In the next room, called “oikos” (“house”), her priests asked the supplient’s question and then interpreted her words in hexameter verse, often with equivocal meaning. MYTH: In mythology, the first Pythia was Femonoe, daughter of Apollo. Initially, the priestess was chosen from virgin girls of noble birth from Delphi. Later the priestess was over fifty years old. In the beginning, the oracles were given once a year, on the 7th of the month Vyssios (current February), the birthday of Apollo. But as worshipers increased, the oracles were given on the 7th of each month, except in winter. MYTH: Then Apollo went to the Hyperborean, far north of the then known limits, where the sun shone constantly and returned in the beginning of the spring. The Oracle of Delphi was like a requisite for the ancient Greeks. The Oracle mediated in very important matters, such as wars. Thus, it acquired enormous power and influence. The Oracle played a decisive part in the great Greek colonization of the 7th and 6th centuries BC. Many missions started their trip after an oracle in order to choose the right place. The Oracle was not always impartial, but offered its services to everyone, regardless of the political situation in a city or region. The “amphictyony” was a federation of the ancient Greek cities with a sanctuary as center. The word comes from the word “amphictyon” and this one etymologically from the prefix “amphi-” (“bi-”) and the word “ktoina”, meaning “settlement”. Therefore it means “the one who lives around”, the “neighbor”. There is also a version that the word comes from Amphictyon, son of Deucalion and Pyrrha, brother of Hellene, but it does not seem correct. Amphiktyonies were established in various parts of Greece. Initially, they had religious responsibilities but, in many cases, gained political power. The Amphictyony of Central Greece was founded in the 7th century BC and its seat was the sanctuary of Demeter at Anthili of Malis, near Thermopylae. When the city of Delphi acceded, the sanctuary of Apollo also became a seat of the Amphiktyony. The Amphiktyony Council met in the spring at the sanctuary of Apollo and in the autumn at the shrine of Demeter. Twelve Greek tribes participated permanently; the Thessalians, the Boeotians (Thebes), the Dorians (Sparta), the Ionians (Athens), the Perevians, the Magnetes, the Locrians, the Oitians, the Achaeans, the Phocians, the Dolopes and the Malians. Each tribe had two votes regardless of population and power. Because the Locrians lived east and west by Phocis, the Ozoli Locrians had the one vote and the Opountian Locrians the other one. There were also non-voting representative the Aetolians, the Akarnanes, the Arcadians, the Elians, the Triphyllians and the Dryopes. Delegates of the twelve tribes were the "pylagores" who participated in the discussion of the issues to be voted on, and two "hieromnemon" who voted. The foundation of the Delphic Amphictyony as it is commonly known, at a time when Athens, Sparta and Thebes had not yet acquired great power, meant that small tribes had the same value with the powerful tribes. Equality, along with the prestige of the Oracle, gave enormous power to the Council, which acquired great competence in the administration of the sanctuary of Apollo controlling its property and its function and appointing priests and other officials, always inhabitants of Delphi. Four wars broke out for the control of the sanctuary. They were called “holy wars”. The first temple of Apollo at Delphi was built in the late 7th or early 6th century BC. At the same time, the first temple was built in the sanctuary of Athena Pronaea. The area was ruled by the neighboring town Krissa or according to others by Kirra, the port on the coast of the Corinthian Gulf. In 600 BC the Delphic Amphictyony decided to punish them because they began to take advantage of the pilgrims, and the first holy war broke out for the control of the oracle. It ended in 590 BC with the destruction of Kirra and Krissa. 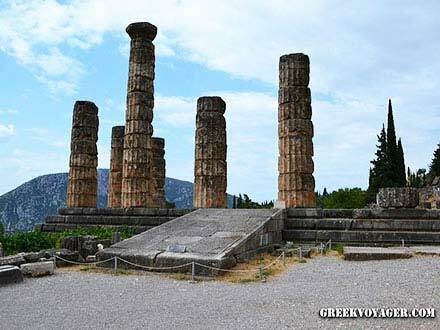 Delphi acquired new territories, while the Amphictyony prohibited any activity in the Krissaeon Field and any new installation in Kirra, and in 586 BC it organized the Pythia Games, the second most important games in Greece after the Olympics. Shortly before 525 BC, the Treasure of the Siphnians was built in the Sacred Way, one of the finest buildings of the sanctuary, dedicated to the inhabitants of the island for its wealth gained from gold and silver mines. In 548 BC, the temple of Apollo was destroyed by fire. A new temple was built in 514-505 BC, with contributions from all over Greece and from foreign rulers, while the great Athenian family of Alkmaeonides undertook the construction. At the same time, the Treasury of the Athenians was erected in the Sacred Way, where, among other offerings of Athens, the tributes for the victory against the Persians, at Marathon in 490 BC, were kept. According to Herodotus, in 480 BC, Xerxes having crossed Thermopylae, sent an army to seize the treasures of Delphi, but when the Persians approached, a rock slide from the Phaedriades stones fell upon them as two legendary local heroes, Phylakos and Autonoos pursued the army. 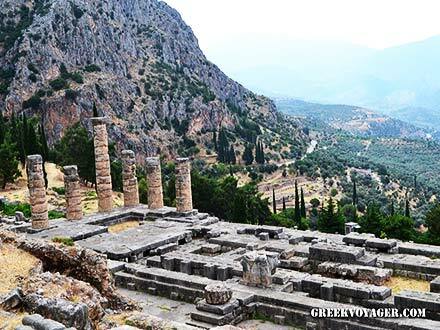 In 458 BC the Phocians took control of the Sanctuary and incorporated Delphi in the federation of Phocian cities. But the Spartans intervened and the second holy war broke out. The Phocians with the help of the Athenians returned and stayed until the Peace of Nicias in 421 BC, when Delphi was declared an independent city. A few years later the Athenians were defeated in the Peloponnesian War and Greece came under the hegemony of Sparta. In the 5th century BC above the temple, the stadium was constructed, where the athletic games of the Pythia were held and in the 4th century BC, the Gymnasium, near the temple of Athena, where athletes trained. In the same century, the theater was built, where the music contests of Pythia were held. In 373 BC, the archaic temple was destroyed by an earthquake. The Sanctuary of Apollo asked again for the contribution of the Greeks to build a new temple, but new wars delayed the works. At that time, the Phocians had been forced to join the alliance of Thebes, a new rising power in Greece. They refused however to take part in its campaign in the Peloponnese and in retaliation, the Thebans accused them in the Amphiktyony Council of cultivating the sacred land of Delphi. In 356 BC a heavy fine was imposed on them. They could not afford it and with the help of Sparta conquered the Oracle. It was the outbreak of the third holy war. During that period, the Spartans, the Athenians and the tyrants of Pherae allied with the Phocians wishing to exclude the intervention of the Macedonians in Southern Greece. In 354 BC the Phocians used the treasures of Delphi to form a large mercenary army and marched against Locris, Doris and Boeotia. When, however, they turned against Thessaly, they caused the intervention of the Macedonians. They defeated them twice, but the third time they were defeated. In 346 BC, Philip II, King of Macedonia, released Delphi, and the Phocians were forced to pay a very heavy fine for the treasures of Delphi, their cities were destroyed and their votes in the Congress were given to the Macedonians who now controlled the Amphictyony. A few years later the Locrians of Amphissa began to cultivate land on the Krissaeon Field and build in Kirra, still a forbidden city. In 339 BC, misguided by the Thebans, they accused, in the Council, the Athenians for sacrilege. The orator Aeschines of Athens, reversed the charges and the fourth holy war broke out. It was the shortest. In 338 BC, Philip II destroyed Amphissa and the Phocians cities involved. In 330 BC the new temple of Apollo was completed. The remains that we see today are from this temple. It was built in the same design and almost the same dimensions as the second temple. In 301 BC Phocis allied with the Aetolian Sympolitia (Confederation),a new force in the Southern Greece. In 290 BC, the Aetolians dominated Delphi and in 279 BC repelled the Galatians, who invaded. The Aetolian cities enriched the sanctuary with their own tributes and Delphi continued gathering wealth and artwork. In 191 BC the sanctuary came under the control of the Romans, who after 168 BC dominated Greece. During the Roman era, at times, Delphi was favored and, at other times, looted. In 86 BC during the Mithridatic wars, it was pillaged by the consul Syllas, who in the same year destroyed the monuments and the walls of Athens. In 83 BC it was plundered again, this time by the Thracians. In 160 – 159 BC, with the donation of Eumenes II, King of Pergamon, repairs and new constructions improved the theater to its current form in the 1st century AD. At that time, in 67 AD, the emperor Nero visited Delphi. He participated in the musical competition of the Pythia and, on leaving, took to Rome five hundred statues. In 84 AD, a prestigious visitor was the emperor Domitian. Despite the gradual decline, the Oracle maintained its formal process until the time of the Emperor Hadrian in the 2nd century AD. Hadrian visited Delphi during his two trips to Greece in 125 and 129. During that time, Pausanias also visited. The great traveler described the site, buildings and monuments and centuries later, when excavations began in the late 19th century, its description was valuable for the archaeologists. A visitor to Delphi was also the Emperor Constantine. He also took artwork back to Constantinople. But the edict of Emperor Theodosius I in 392, which banned ancient cults, was the end for the Oracle of Delphi, too. Disasters followed by fanatical Christians. With the prevalence of Christianity, Delphi became the seat of a bishopric, but in the 7th century was abandoned with the raids of the Slavs. As time went by the Sanctuary of Apollo was covered by soil. In medieval times, a village was built on the “navel of the earth”. It was called Kastri. Here, in 896 AD, Hosios Loukas was born, founder of the famous monastery with the same name on the Helicon Mountain. 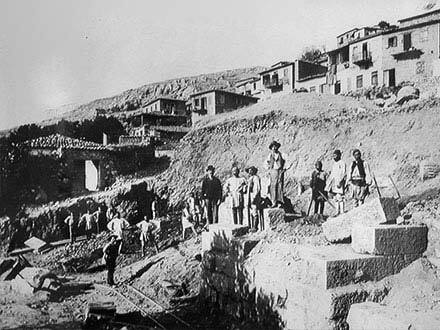 The first archaeological excavations were in 1860 by the Germans. In 1891 the Greek government gave permission to the French Archaeological School of Athens for the excavation of Delphi while the German archaeologists were given Olympia. However, the archaeological site was buried under an entire village. The residents of Kastri did not want to leave. But, when an earthquake caused disaster, they agreed to settle in a new village, which is the current town of Delphi. The French began, in 1892, the "great excavation" as it was called, which quickly brought to light the buildings of the Sanctuary of Apollo and thousands of finds; among which were three thousand inscriptions, valuable for knowledge of public life in antiquity. The unique monument where all the ancient material was found was the Treasury of the Athenians. 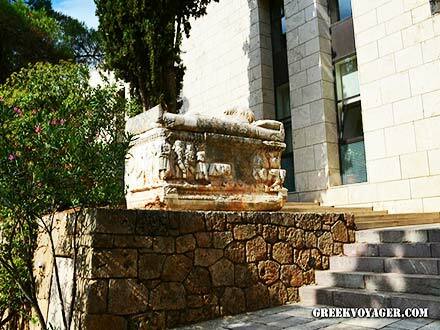 It was restored in 1903 - 1906 by French archaeologists sponsored by the City of Athens. In 1903 the first museum was built designed by the French architect Albert Tournaire with a donation from the Greek benefactor Andreas Syngros. 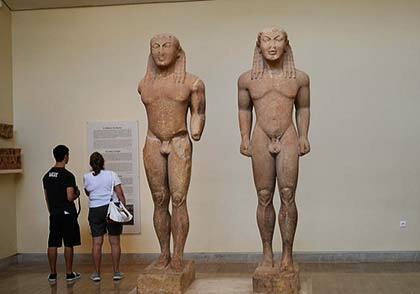 The excavations and restorations of the Sanctuary of Apollo, as well as the Sanctuary of Athena Pronaea continued – and continue with the collaboration of the Greek Archaeological Association and the French Archaeological School of Athens. 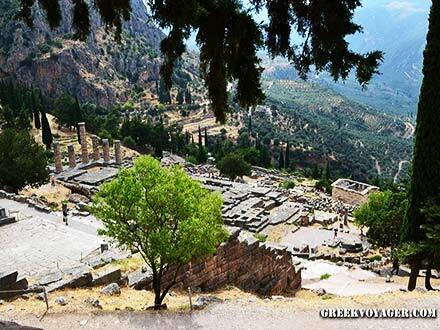 From the very beginning, the archaeological site of Delphi charmed millions of famous visitors and the public. Among the notable supporters was the great Greek poet Angelos Sikelianos, who, with his first wife Eva Palmer, sought to revive the "Delphic Idea" by creating a global cultural center that would eliminate the conflicts among nations. The pair revived the "Delphic Festivals" with the tragedies of Aeschylus “Prometheus Bound” in 1927 – the first performance since antiquity in the ancient theater of Delphi – and “Suppliants” in 1930, as well as other events; but there was no continuity. Angelos Sikelianos died in Athens in 1951 and was buried, as wished, in Delphi, where his house in the town of Delphi is a museum. 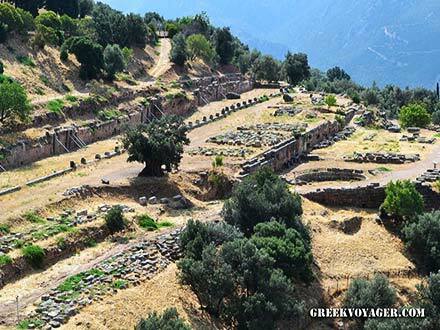 Those who come to Delphi from the east, passing Arachova, first see the Sanctuary of Athena Pronaea, located on the lower side of the national road towards the valley. The Gymnasium of Delphi is close by, while on the upper side of the road, the first and the later Castalia Fountains are located. Higher up, is the Castalia Spring. Continuing on this road, the Sanctuary of Apollo, the heart of the site, is situated. Approaching from the west, passing the town of Delphi, the first building in view is the Archaeological Museum of Delphi and immediately after the entrance to the main archaeological site, located on the southeastern side, as in antiquity. Outside the Sanctuaries of Apollo and Athena Pronaea, there are Classical and Roman remains and tombs of the city of Delphi. To enter the Sanctuary of Apollo, which was protected by a surrounding wall, visitors followed, as they do today, the Sacred Way, which was charted in the Archaic Period. The current walkway was created at the beginning of the Byzantine era by the inhabitants who built the village on top of the sanctuary. The Sacred Way was two hundred meters long and twisted upward to the center of the sanctuary facing the monumental Altar of Chians and the Temple of Apollo. It had a ceremonial character. On this walkway, festival processions were held and suppliants to the oracle followed its path to offer sacrifice. On both sides of the path, there were votive offerings. In the beginning, there were statues and other sculptures followed by the famous treasuries, small buildings like temples, dedicated by the cities to Apollo. At path’s end, in front of the temple, there were the greatest offerings by cities or wealthy individuals; also the monument dedicated by all Greeks after their victory in 479 BC at Plataea, which marked the end of Persian danger to Greece. The temple was built on a large platform supported by a large retaining well on the south side. Over time, the sanctuary expanded as visitors and offerings continued to increase. The site was developed on the slope. Thus, retaining walls were built, which supported various levels, one after another, with gates leading from the surrounding wall. In between there were stoas with votive offerings. The Treasury of the Siphnians was one of the most beautiful buildings in the Sanctuary of Apollo resembling a small Ionic temple. It was one of the first treasuries along the Sacred Way located on the left side, next to the Treasury of Sicyon and opposite the Treasury of Megara. Today we can see the foundations and a knuckle-bone from the decoration of the base. 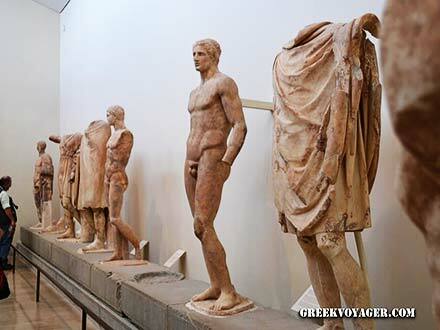 The sculpture decoration is one of the most important exhibits in the Archaeological Museum of Delphi. Siphnos was one of the richest islands due to its gold and silver mines. After discovering a new mine, the inhabitants decided to offer the tithe of the profits to Apollo building a treasury of precious white Parian marble at a time when most buildings were made of limestone. It was the first all-marble building in mainland Greece. It was built shortly before 525 BC, the year Siphnos was looted by fugitives from Samos, who had revolted unsuccessfully against the tyrant Polycrates. The sculpture decoration is considered one of the masterpieces of the late Archaic Period. On the façade of the building between the pilasters, the peristyle was not supported by columns, but on two “kores” (“young girls”), characteristic statues of Ionic art of the time. The building was surrounded by a relief frieze, where various scenes were sculpted with amazing rendering of details. The western side depicts MYTH: Paris who chooses the most beautiful goddess among Athena, Hera and Aphrodite; the south side , the rapture of a woman, either Hippodamia by Pelops, or Lefkippides, daughters of Leucippus, by Dioscuri – one of the most popular myths of poets, sculptors and painters of all time; on the northern side, which is better preserved than the others, the Gigantomachy, the battle between gods and giants; and at the eastern side on the façade, the gods of Olympus, watching a battle during the Trojan War. MYTH:There was also a relief decoration on the pediment of the facade, which depicts the myth of the conflict between Hercules and Apollo for the Delphic tripod. In the center Zeus tries to separate them. The treasury was built around 500 BC. According to some, including Pausanias, it was built in 490 BC commemorating the great Athenian victory over the Persians at Marathon, which is also mentioned in an inscription at the base of the building; according to others, earlier, in the time of Cleisthenes, as an expression of gratitude for the abolition of the tyranny of Pisistratus and his successors in 507 BC; they also point out that sculpture themes on the metopes lead to the same conclusion. The Treasury had thirty sculptured metopes, six on the east side of the façade, six on the west back side, nine on the north and nine on the south sides. On the metopes of the facade and south side, the exploits of Theseus were depicted; a subject that prevailed in the art of the 5th century BC. On the north and back sides, the labors of Hercules, a theme of the artists in the 6th century BC. It is believed that the contrast reflects the change of government in Athens with the victory of democracy. The building resembles a small Doric temple built on a base with three steps. The upper structure was of Parian marble. In the front and south side, which faced the turn of the Sacred Way, a platform was constructed as a triangular square, where, during celebrations, the Athenians exhibited the spoils of the battle of Marathon and the trophies of other victories kept in the Treasury. Many wall inscriptions have been preserved, which are valuable for the study of ancient celebrations and customs. Exceptionally important for music is the inscription at the south side of the two famous hymns to Apollo. The only ancient Greek texts with musical annotations! The interior walls are inscribed with honorary decrees for Athenians, after the 3rd century BC, as well as the names of pawnbrokers who later used the building. The decorative relieve sculpture on the metopes, pediments and corner ornamentation were examples of fine sculpture at the end of the Archaic Period. The metopes were removed and restored and are displayed in the museum. In their place are plaster casts. But the large part of the pediments and corner decorations have not been found. Ascending the Sacred Way, we see a wall, behind the Stoa of the Athenians. It is the famous Polygonal Wall, which supports the south side of the platform where the Temple of Apollo is built. At the time the temple was built, a terrace – an artificial platform – was created, which was supported by two almost parallel retaining walls. The wall at the upper north side protected it from falling rocks and the wall at the lower south side retained the soil. The Polygonal Wall, now preserved and cleaned, was built without joints, but with perfect adaptation of the stones. The length of the long side is 90 m. It was constructed after the destruction of the first temple by fire in 548 BC. Later, this wall supported the Athenian Stoa, which can be seen even today. The upper part is missing, but it is estimated that there were four or five more layers of rectangular stones, so it was two meters higher. The surface is engraved with about eight hundred inscriptions, most of which are decrees on freeing the slaves, especially the 3rd and 2nd century BC. 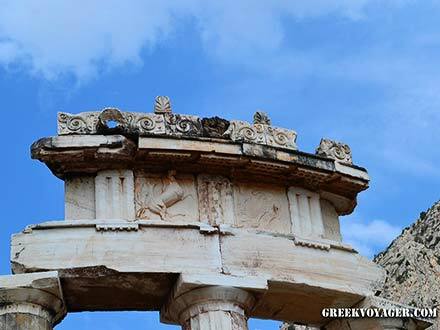 The Stoa (Arcade) is one of the most important votive offerings of the Athenians to the Sanctuary of Delphi It was built below the temple, in front of the Polygonal Wall, opposite the “Alos”, where religious ceremonies were held. The back wall was the eastern part of the Polygonal Wall. The lower part of the Stoa of the Athenians is preserved and can be seen. It was built in the Ionic style with seven monoliths and fluted columns of Pendelic marble and Parian marble bases. The roof was made of wood and the mainstay of the building of local limestone in three tiers. It was built after 478 BC, the year when the Athenians destroyed the floating bridge of Xerxes at the Hellespont, which is referenced in the following inscription on the base of the monument. ΑΘΗΝΑΙΟΙ ΑΝΕΘΕΣΑΝ ΤΗΝ ΣΤΟΑΝ ΚΑΙ ΤΑ ΗΟΠΛΑ ΚΑΙ ΤΑΚΡΟΤΕΡΙΑ ΕΛΟΝΤΕΣ ΤΩΝ ΠΟΛΕΜΙΩΝ. "The Athenians dedicated the Stoa and the 'weapons' (cables from the bridge) and the figureheads of Persian ships." In subsequent years, the spoils of other naval Athenian victories over the Persians – in Mycale, Sestos and elsewhere – also found their place in the Stoa. The Temple of Apollo is at the center of the Sanctuary. The remains we see today are from the third temple, built in 330 BC, which has been restored. MYTH: According to mythology, the first temple was made of laurel branches, the second from bees wax and feathers, and the third of copper. The fourth temple was built by the mythical architects Trofonios and Agamedes with the help of Apollo. This was, as archaeologists say, the first limestone temple, built in the late 7th or early 6th century BC and destroyed by fire in 548 BC. The second temple was completed in 510 BC. It was built with contributions from all over Greece and from foreign rulers, under the care of the great Athenian family of Alkmaeonides. It was Doric, made of limestone, with six columns on the marble facade, and fifteen on the side with excellent sculpture decoration. On the eastern pediment, MYTH: a scene of Apollo at Delphi with his sister Artemis and their mother Leto was depicted, and on the western pediment a scene from the Gigantomachy. The temple was destroyed in 373 BC by an earthquake and Delphi again asked for contribution from the Greeks to build a new temple. But wars delayed the work and the third temple was finished in 330 BC, built with the same design and almost the same dimensions as the second temple. The architects were Spintharos of Corinth, Xenodoros and Agathon. It was also Doric, with six columns in the front, six in the back and fifteen at the sides, with a prodomos (vestibule) and opisthodomos (back chamber). The nave was divided into three aisles by two rows of columns. Each had eight Ionic columns. At the deepest point was the “adyton” (sanctum) with a statue of Apollo and the navel of the earth. .Here, the Pythia was isolated and only the priests could enter. The pediments were of Parian marble and the sculpture depictions were created by the Athenian sculptors Praxias and Androsthenes. The eastern pediment is sculpted with Apollo and the Muses and Dionysus with Thyiades (Maenads) are on the western pediment. On the walls, epigrams of two or three words of the seven sages were engraved, as well as the letter E. There was also a bronze image of Homer and an altar of Poseidon. Conserved pediment fragments of both Doric temples are exhibited in the Archaeological Museum of Delphi. Northeast of the temple, among the votive offerings of the Aetolians, the Phocians and others, was one of the most impressive private offerings in the Sanctuary of Apollo. The tribute of Daochos; a sculptural composition with rectangular stone plinth where nine marble statue stood, a work of Lysippus, famous sculptor of the 4th century BC, or of an artist from his school. In 337 BC, Daochos II, from Pharsala of Thessaly, dedicated the monument to honor members of his family who were notable military men and great athletes. He was the tetrarch of Thessaly, which he represented as “hieromnemon” in the Delphic Council from 339 until 334 BC and had friendly relations with Philip II, King of Macedonia, who controlled Thessaly and the Delphic Amphictyony. 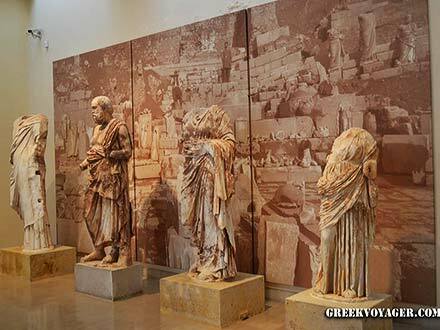 The base and surviving statues are restored and on display in the Archaeological Museum of Delphi. Inscriptions on the monument include the names and achievements of those depicted. The succession of statues began on the right with a statue of Apollo seated on an omphalos. This was followed by the statue of Aknonius, patriarch of the family who presents his family to the god, Apollo; first his sons, winners in Greek games: Aghias, great athlete of pankration, Telemachus, wrestler, and Aghelaos, runner, who, according to the inscription, all were winners at the Pythian games of the same year. They are followed by Daochos I son of Aghias, his son Sisyphus I father of Daochos II, Daochos II himself and his son Sisyphus II. The ancient theater of Delphi, where the music contests of the Pythian Games and religious ceremonies were held, is located in the northwest corner of the Sanctuary. The original form of the theater is not known. Perhaps, spectators sat on wooden seats or on the ground. The first stone theater was built in the 4th century BC. In 160-159 BC, with a donation from Eumenes II, King of Pergamon, repairs and new constructions were made, such as the paved orchestra, the stone seats and the stage and the theater we see today was formed. Excavations and maintenance have been conducted but there is much damage. Seating capacity was 5,000 spectators. The concave to the north and west is built on natural bedrock, in the south and west on artificial fill due to the slope. It is separated by a paved landing creating two tiers. On the upper tier, there are six sections with eight rows of seats, and on the lower tier seven, with twenty-seven rows of seats. The orchestra was shaped like a horseshoe. The paved floor was constructed during the Roman period. Only the foundations of the stage remain.. It was probably divided into two, a foreground and the main stage. In the 1st century AD, its facade was decorated with a frieze depicting MYTH: the Labors of Hercules. Engraved in the walls of the byways are inscriptions regarding the emancipation of slaves. But the texts have been nearly erased over time. 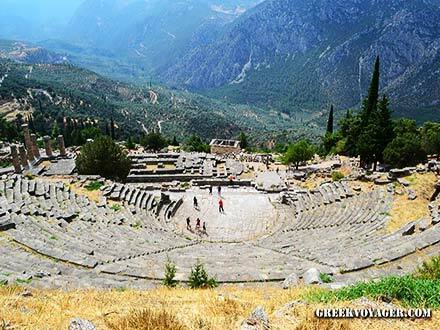 The ancient stadium of Delphi is located higher than the ancient theater. The path starts from the left passage of the theater and goes upward to the northwest through the trees. It is the same path used in antiquity to watch the athletic events of the Pythian Games. It takes some effort, but worth it. It is one of the best preserved ancient stadiums; maintenance and restoration have been conducted. The entrance is on the east side. 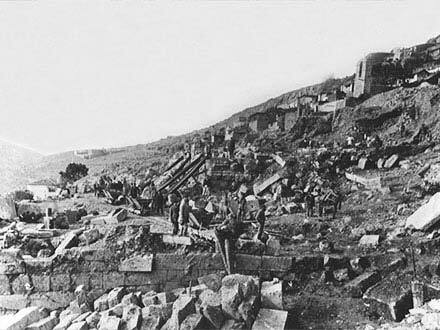 As with other large structures at Delphi, the sloping ground was crucial for forming the area. The upper northern side was developed on natural ground, the lower southern side on artificial earth fill supported by a retaining wall. According to the inscription on this wall, the stadium was built in the 5th century BC. The spectators sat on the ground or on wooden stands. 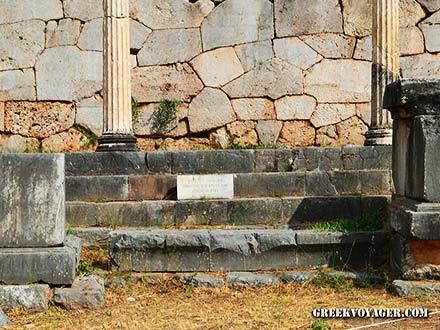 Stone seats were built much later, in the 2nd century AD, under Herod Atticus, a rich Athenian, who was also the donor for the construction of the famous homonymous Odeon of Athens. At that time, the monumental arched entrance was built, unique in an ancient stadium in Greece. It is formed with a triple bow mounted on four pillars – massive square columns – of which the two central columns had niches for statues. Behind the entrance a rig with five steps is carved into the rock. It is from an earlier construction. The stadium seated 5,000 spectators. It is shaped like a hairpin. The tiered rows begin at the east, from the upper and lower side of the entrance, and are joined at west forming the “sphendone” (bezel). The bearings of the upper side are extended in twelve rows and on the lower side in six because of the slope. Here are the scales, while among the seats of the upper side was the place for the jury. The length of the track is 177.55 m, as a Roman stage, and the width 25.50 m.
The Sanctuary of Athena Pronaea is located east of the Sanctuary of Apollo. “Pronaea” means “before the temple” (in this case: the Temple of Apollo), and visitors from Athens first saw this sanctuary, as today. The Tholos (Dome) of the Sanctuary of Athena, visible from above, is a circular building and one of the most distinctive ancient monuments. There are also the remains of three temples of Athena, altars dedicated to various gods and goddesses, two Treasuries, one Doric and the other Aeolic, as well other findings. The two temples were built in the same place, one in 650 BC and the other in 500 BC. The third temple was built on the west edge of the sanctuary after devastation by an earthquake in 373 BC. One Treasury was a tribute from Marseilles, a colony of Phocaea, the great Ionian city of Asia Minor. A surviving column capital with palm leaves is distinctive. There are also the remains of a building dedicated to the worship of Phylakos and Autonoos, the heroes who chased the Persians when they attempted to invade Delphi, as well as a building called the “House of the Priests”. The Tholos is situated between the later temple and the Treasury of Marseilles. It is a circular structure, the use of which is still unknown. It has been associated with chthonic cults, but Pausanias, who saw its ruins in the 2nd century AD, does not mention it as a temple. 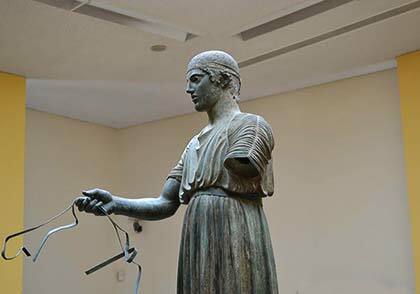 It was partly restored in 1938 and the surviving sculpture and architectural members are housed in the Archaeological Museum of Delphi. 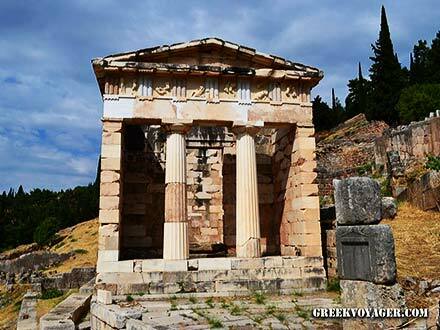 The Tholos is considered one of the masterpieces of classical architecture, where almost all the styles of classic architectural design are combined. It was built in 380 BC. Vitruvius, the Roman writer, architect and engineer, known for his unique treatise on architecture, says that it was constructed on an architectural scheme by Theodoros from Samos, who had written a book about how theTholos was built. The building is on a podium of three steps. The outer peristyle had twenty Doric columns supporting a frieze of metopes with relief decoration of the Battle of the Amazons and the Battle of the Centaurs. In the interior of the circular nave there were ten Corinthian half columns. 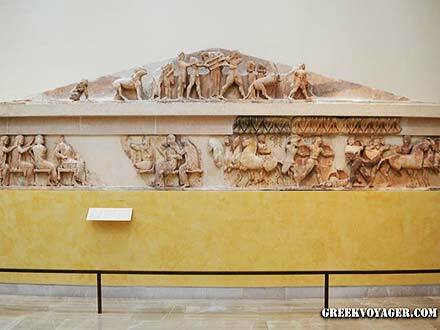 The frieze was Doric with smaller sculpted metopes. The upper side reflected different colors using a combination of Parian and Pendelic marbles and the blue limestone of Eleusis. The roof was also made of marble. Northwest of the Sanctuary of Athena is the Gymnasium of Delphi, considered one of the most complete ancient Gymnasiums, with spaces for training of the athletes, a palaestra and baths. It was founded in the 4th century BC and used until the Roman era; at which time the thermal baths were constructed. During the Hellenistic period, it was primarily an educational center and centre for lectures. The Gymnasium spread over two plateaus. In the upper plateau was the “xystus” (“scraped”) for runners and at the lower of the palaestra for wrestlers, boxers and athletes of the pankration. The "xystus" was a covered colonnade, 178.35m long and 7m wide used for practice. It was discovered in more recent excavations. It was used for training runners in bad weather and owes its name to the fact that it was scraped flat. It was a Doric limestone construction. During the Roman era the colonnade of the facade was replaced with Ionic marble columns. There was also the “paradromis”, a flat outdoor track, 6 m wide, also for runners. The palaestra consisted of a square court for training surrounded by a colonnade and rooms on all sides for changing and other sports use. West of the palaestra is a circular pool (cool) 10 m in diameter and 1.80m deep, part of a Greek bath. Behind it, faucets conveying water from the Castalia Spring into ten stone basins, which were douche baths the athletes. Further west there were the hot Roman baths, constructed in 120 AD. In Byzantine times a monastery was built on the site of the Gymnasium; its church was in the palaestra. It was demolished in 1898, at the time of the first excavations. On one of the columns used in the monastery, Lord Byron carved his name. 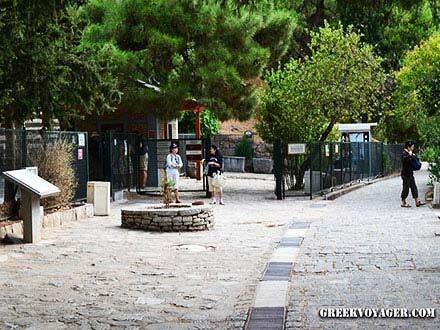 Above the national road, in the ravine formed by the Faedriades Stones, at the base of the Flemboukos rock, called Yambia in antiquity, is the Castalia, the sacred spring of Delphi. MYTH: It was named after the nymph Castalia, who fell into its waters to escape from Apollo, who was in love with her. MYTH: The water reaches the Plistos River, in the valley below Delphi, where, according to mythology, was the nest of Python, killed by Apollo. Lower down are two fountains; the earliest next to the road and the later, uphill, close to the spring. The water reached the first Castalia Fountain, built in 600-590 BC, by a rock-cut pipeline under the ground. The fountain is located next to the road and is called Lower Castalia. It was excavated in 1960. It is a rectangular structure 8.20x6.60cm consisting of a closed basin with pipes and hydrants. In front, there is a paved courtyard with a small staircase leading to stone benches. By the early Roman period, it had been refurbished many times. The later fountain, called the Castalia of Rock, was built in the 1st century BC. It is located fifty meters above the first, closer to the spring; it was excavated in 1878. This fountain was seen by Pausanias. The fountain was built in a rock-cut hollow 11 m long x 12.50 m. high, with niches for votive offerings to the nymph Castalia. During Ottoman Rule the largest niche was a chapel dedicated to St. John the Baptist. The water was channeled by a closed pipe. On the basin’s façade, there were seven bronze spouts. In front, eight steps led to a lower, paved courtyard with stone benches. Both fountains have been conserved and restored but visits are limited due to falling rocks from the Phaedriades Stones, which often prohibits entrance to Castalia. 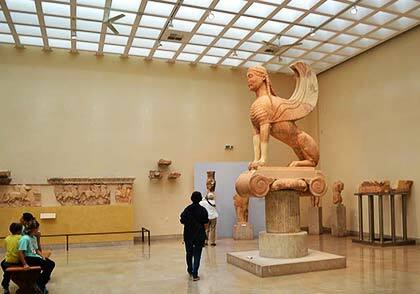 The Archaeological Museum of Delphi is located next to the archaeological site of the Sanctuary of Apollo. Designed to reflect the serenity of the environment, the building houses in the sculptures, statues and other artifacts relevant to the history of the sanctuary and the Oracle. 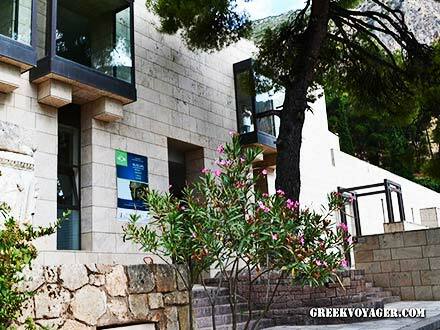 It is one of the oldest museums in Greece. The first building was constructed in 1903 and designed by the French architect Albert Tournaire with funding from Greek benefactor Andreas Syngros. The findings of the first excavations, which began in 1892 by the French School of Athens, were placed on exhibit. The museum was restored in 1935 – 1936. In 1939 the new exhibition was ready but the outbreak of the Second World War prohibited its opening to the public. 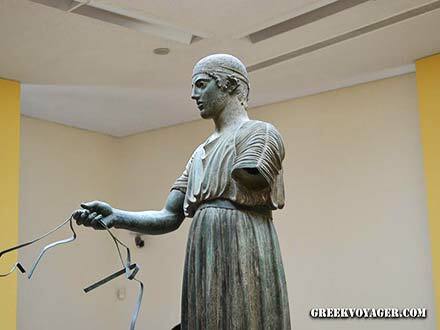 Many artifacts, including the famous Charioteer, were transferred for protection to Athens and were returned in 1952. Renovation of the building began in 1958 and the new exhibition was ready in 1963. In 1978 a new room was inaugurated for the gold and ivory findings discovered on the Sacred Way of the Sanctuary. In 1999 a new major renovation was completed. The museum was expanded and modernized. New laboratories and offices were constructed, the surrounding area was refurbished and reception areas and services to the public were created; also, ramps and elevators were installed for persons with special needs, a café and bookshop. This modernization highlighted a new presentation of the exhibits. The Archaeological Museum of Delphi is a two storey building with an area of 2,270 sq m. The permanent exhibition unfolds in fourteen rooms depicting the history of the Sanctuary and the Oracle from the Prehistoric era to the end of the Antiquity in chronological order. It also focuses the visitor's attention on specific groups of findings – from the Temple of Apollo, the Treasury of the Siphnians etc. There is visual material – texts, models, representations and maps – in order to understand the placement of the exhibits on the site. West of the archaeological site of Delphi is located the current settlement of Delphi, on the slope of Mount Parnassus, at an altitude of 550 to 590. It was founded in 1890 for the residents of the village Kastri, situated on the Sanctuary of Apollo and demolished to begin the excavations. Today it is a tourist center, the nearest to the archaeological site residential area. There are all the options for accommodation, dining and shopping and the view to the valley and the bay of Itea is wonderful. Of particular interest is the church of St. Nicholas. There are also the old church of St. Constantine and the house-museum of the poet Angelos Sikelianos. On the west side, in a beautiful natural environment, is located the European Cultural Center of Delphi, a foundation for major international cultural events and meetings. 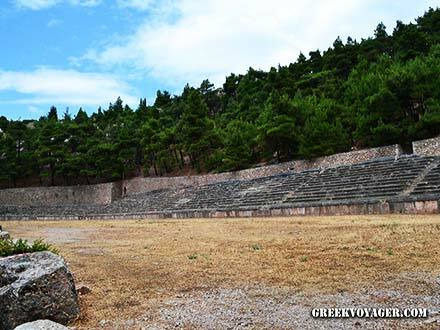 Among others, there is the modern theater “Phrynichos”, while in the pine forest of the Center an open sculpture park is extended. 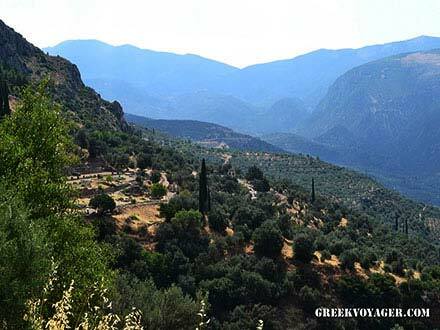 Five kilometers south of Delphi is located Chrisso over the vast olive grove of Amfissa. A beautiful traditional settlement with sources, green, two picturesque squares with plane trees, accommodation facilities and traditional taverns. Of particular interest is the architecture of the houses. We can also see remains of the wall of the ancient city Krissa. In the plain there was the ancient Hippodrome, where the horse and chariot races for the Pythian Games took place. Northwest at 7 km, it is the monastery of Prophet Elias, at an altitude of 400, with wonderful view to the olive grove and the Corinthian Gulf. We can also go from Delphi. The monastery played an important role in the Greek Revolution of 1821 and in August 1825 it was destroyed by the Turks. It was burned again by the Italians in 1943. Rebuilt since 1961 and renovated after converting to a women monastery, it keeps a part of its history in its library, in manuscripts and letters from the Revolution. The entire region has a nice climate and many interests all year round. The sea is fifteen minutes away by car and the ski center of Parnassus on the east thirty minutes. Close is also the traditional small town of Arachova and on the slopes of Mount Parnassus many beautiful villages. Around, the natural beauty of the National Park of Parnassus! Of particular interest is the route to the lake of the Mornos River and from there to the surrounding historic villages. Across the region there are monasteries; among them, the famous Monastery of Hosios Loukas. Also trails for nature lovers and hikers. Fifty meters from the coast-where a shipyard used to lie where artistic craftsmen and shipbuilders used to built the elaborate and renowned sailing ships of Galaxidi. 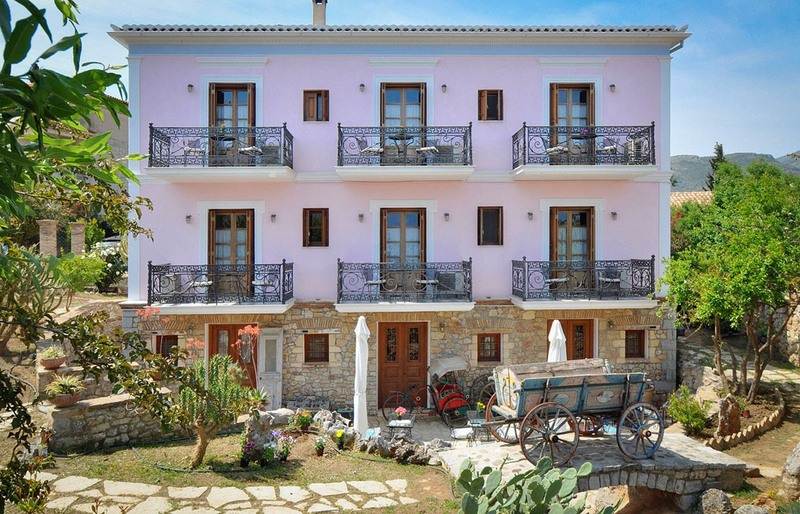 Built in the traditional neoclassical style of Galaxidi. Warm atmosphere, wooden floors. Equiped for all seasons with many extras to make your stay comfortable and happy!